Google’s Instant looks like a simple change to help users though you should be aware of how it moulds your brand visibility and the how it nudges searchers during their search interactions. Google Instant offers ‘suggestions’ as searchers type words into the Google search box and though this approach is not new Google has contrived a new way to offer search word suggestions that can shape your brand message by offering searchers keywords as they type. If you are a brand owner this problematic and the keywords suggested are ones that you didn’t purchase or negatively impact your brand and potentially determine whether searchers even find your brand. We have tested a number of cases and found the simple story that includes Nescafe, Starbucks, Amazon and Google’s Instant to illustrate the peril of Google Instant to your brand value and the structrual flaw with SEO–you let Google shape your brand, and it may not be to your benefit. On the plus side it ‘saves time’ for searchers as now they don’t have to read the search engine results pages or SERP to find what they seek. For brand owners however it may appear that Google’s Instant is another way to extract advertising revenues as the ‘big brands’ magically appear even if their products are new or not well known. Bad new for SEO however as the concept of page ranking disappears as brand owners will now focus on ranking with instant suggestions rather than on a page. While there is no public ‘rate card’ yet but bloggers out there see this opportunity and if Google doesn’t do it then another search engine will or better still a Social Media site! Imagine if you had a very valuable consumer products brand, let’s say coffee and one of your most profitable and well respected products is instant coffee. Now imagine waking up one morning and receiving a call from your marketing manager saying that your site traffic was down, your internet marketing responses just tanked and your SEO reports and internet marketing software appear to show that Google Instant may be the problem! Could this happen to you? Google Instant is new, a couple of days old when this blog post was written so not many of the billions of internet users have heard of it and fewer understand its implications, but one thing appears clear, Google Instant trumps Nescafe Instant Coffee in a search–imagine that! 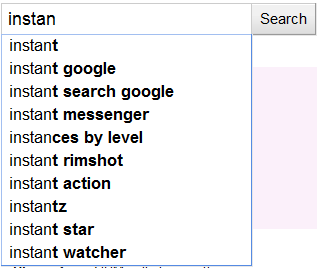 Note is the suggestions offered as I type ‘instant’ into the search box and how it differs from a typical search process where you see a search engine results page or SERP after you type ‘instant’ and submit the word to Google. Google Instant Trumps Brand Visibility and Messaging. 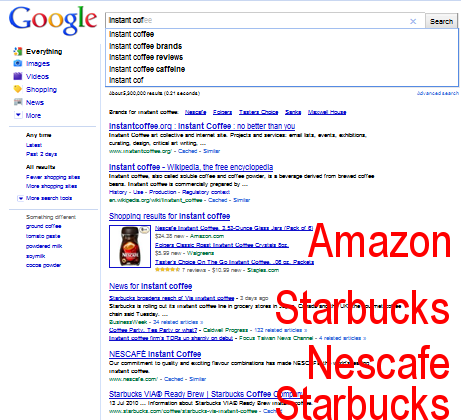 This is what a ‘regular’ search looks like and the visibility of Nescafe is ok. Amazon ranks higher as their business model is really SEO not books as most people think and affiliate marketers contribute a huge chunk of Amazon revenues by standing between Nescafe and their customers. You may re-consider both SEO and Google Instant after seeing them both up close and this is way since early 2009 over half of searches begine in Social Media sites and why IBM is nudging their channel partners into the Social Media spaces–profit. Resonance is the core of Twitter’s advertising model and avoids the dark side of SEO, spam and making people believe that they should surrender their brands to SEO and those that shape it.We can help you with SEO too if that’s what you need, call us to learn more about the rising impact of Social Media on internet marketing and how Resonance as a better, cooler, faster and more effective alternative to Google Instant and the erroding value of SEO. Social Media lets ordinary people create value by sharing their perspectives by posting blog content or Tweeting in their community spaces and places. The simple act of blogging shares perspectives among people and in the rich perspective we may see how many different names describe the ‘same thing’ or how one name may be used to describe many ‘different things’. Indeed resonance inspires content and Social Media helps us create value with perspectives. 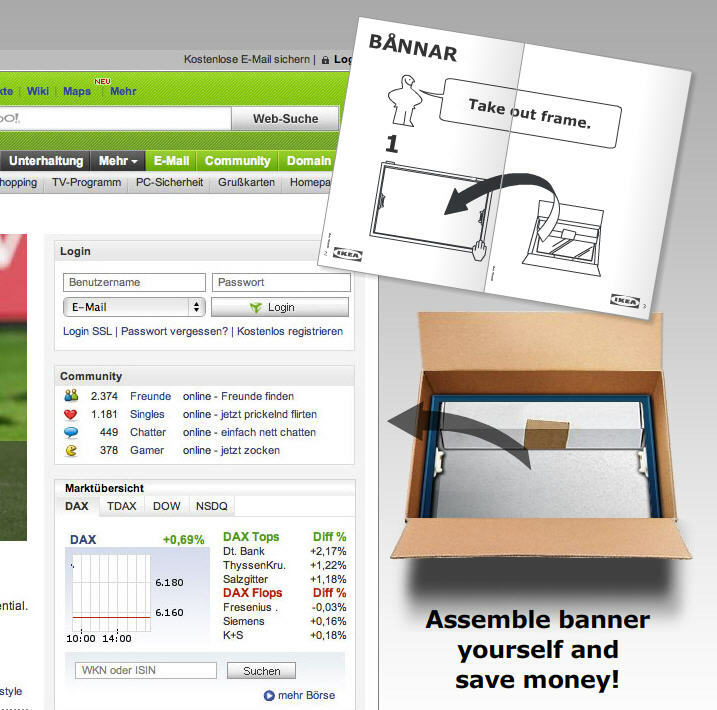 From a seller’s perspective precision is next to godliness and this becomes evident as CEO’s strive to achieve ‘market visibility’ when they make their pronouncements of future sales numbers to stock market investors and likewise they demand precision in the budgets that are presented to the board for approval. All risk is factored by sophisticated formulas and net present values in order to achieve their corporate objectives so that all employees survive and thrive. Oddly enough things never quite go the way that CEO’s determine is best for them and the corporate trust that is in their charge and when I read about a corporations ‘meeting their numbers’ I wonder how the numbers were ‘shaped’ to achieve this stunning feat. Oddly enough corporations put on the appearand of precision in order to convey a sense of control in a world that changes in unexpected ways by the second. Remember that the military term ‘command and control’ is applied frequently to corporate operations. While there are as many different ways to name something as leaves of grass, consider how these two ways to name might help. This second namiong approach is technically not a name but rather uses semantic meaning to link any searcher that ‘googles’ “Any words used in similar spaces share meaning.” to multiple links within a search engine results page or SERP. Each link representa a different story perspective or name that might appeal to different searchers–all of the stories may lead to a brand or single name or multiple names. Note that in this second case we don’t have to know which story or name appeals to searchers, they tell us by ‘declaring’ or selecting what is important to them at the time they see their options. Names rule in Social Media Internet Marketing because they reflect multiple perspectives which can be selected according to the needs of searchers rather than commanded and controlled by corporations or sellers regardless of value to buyers. The ability of almost any blogger to influence SEO page rank simply removes the perception of control for corporations who depend on SEO to minimze their marketing risk. You will be forced to assess the impact of Social Media on your branding and marketing investments and sooner would be better than later, in our experience.